Nakasendō is one of Japan’s most ancient thoroughfares, and one of modern Japan’s most beautiful walking trials. It is 534km of winding trails through the mountains between Tokyo and Kyoto. The full trail features several smaller walks between small traditional towns. This is a moderate walk, suitable for anyone who can walk 3-4 hours at a time. This is an area still reminiscent and nostalgic for the Edo period (1603-1868). The Edo Period was the final period of traditional Japan. It was a period of internal peace, political stability and economic growth. Edo is the old name for what is now known as Tokyo. Takayama sits in Japan’s mountainous Gifu prefecture. It is famous for craft shops, museums, old wooden merchants’ houses and high quality sake. A highlight of Takayama’s calendar is the Takayama Autumn Festival held in October. The festival worships Hachiman, God of Warriors and divine protector of Japan, dating back to the 1600’s. During the festival, beautiful festival floats parade through the streets, many featuring fabulous Karakuri doll performances. Hachiman’s portable shrine (mikoshi) is also paraded around the town. Takayama is also the gateway to the Shirakawa-go, a UNESCO heritage listed area. This area is famous for traditional farmhouses called gassho-tsukuri, dating back over 250 years. The steep A-frame thatched roofs are able to withstand the huge snowfalls that occur in the area. The community all pitch in to rethatch the roofs every few years. Kamikōchi, in the Japanese Alps, offers some of the most beautiful mountain views in Japan. It is a 15km long plateau, surrounded by stunning mountains. The area is open from April to November and offers a wide variety of walks for all different levels of experience. If you have no hiking experience, the safest routes are along the Azusa River. Otherwise, some of the more challenging routes go all the way to the summit of the surrounding peaks, offering amazing views! The walks are well-maintained, but we do suggest good walking shoes! Kamikōchi is particularly beautiful through the autumn season, when you can see the wonderful “Koyo” colours of the leaves on the trees. 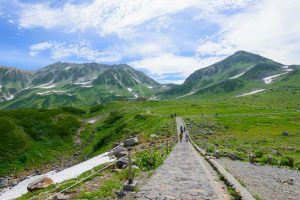 The Kurobe Alpine Route passes through dramatic landscapes of Mount Tateyama. Mount Tateyama is one of Japan’s holy mountains (along with Mount Fuji and Mount Hakusan) and boasts a unique volcanic landscape. The 90km route connects Omachi with Toyama City. Both starting points are around 4 hours from Tokyo by Shinkansen. The route features several modes of transport, including trains, buses, cable cars, and ropeways. The total trip takes around 5 hours. There is a lot do see and do on this route. Learn all about the rare alpine flora and fauna unique to the mountainous regions of Japan at the botanical garden. 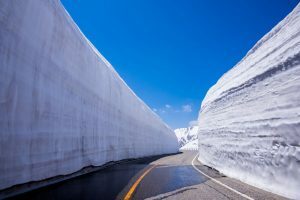 The “Murodo”, a huge snow corridor that is present even in summer. You can walk through the corridor or jump on a bus – a very unique experience, as the walls can get up to 20 metres high! The Kurobe Dam is the tallest dam in Japan and visited by lots of tourists from all over the world. There is a walking track around the dam, or you can take a half hour cruise of Lake Kurobe. Climb 220 steps to the Kurobe Dam observation deck, where you will get amazing views of the dam. The dam took over 7 years to build in the 1950’s and you will find a sculpture to commemorate the 171 lives lost during construction. The Kurobe Alpine Route sits at an elevation of 3000 metres, so remember to pack warm clothes – no matter what season you go! Myōkō is one of Japan’s oldest ski towns, famous for some of the best and longest vertical runs in the Japan. It is a traditional Japanese town and provides a wonderful cultural experience. There is more to Myōkō than skiing though, there is also plenty to do in the off-season! The mountains make for interesting and beautiful walks from Spring to Autumn. The onsen is a must do experience for your first time to Japan. Or enjoy the scenery from an outdoor Rotenburo (outdoor hot springs) as well. Enjoy local sake and beer, or a crepe from the street vendors on the main street. Other activities include a snow monkey park, bird watching, hiking and nature walks, waterfalls, historical sites, and temples. Myōkō was not originally built as a ski resort. Instead, the village was founded around its mountain. 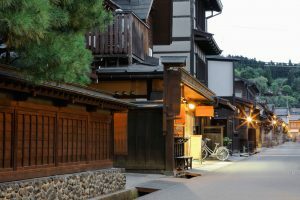 This gives Myōkō a unique feeling of a quaint and traditional small town, rather than a large ski resort. No matter where you choose to go in Japan, you will have the time of your life. However, the full experience of Japan comes from the contrasts between the ultra-modern cities and the relaxing, traditional feel of the smaller villages. Take some time during your holiday to explore the back roads and get the authentic experience of local life. Are two wonderful trips in 2017, we are hosting an escorted group tour of Japan in May 2018 that takes in some of these areas. Not sure what to expect? This video is compiled from photos of our 2015 tour!